passing through the bridges of Brooklyn, Manhattan, Williamsburg and Queensboro. An International Day of Prayer for Peace. A 6:00 P.M. Mass participated by the International Community. To celebrate the birthday of the Mother of God, the Lady of All Nations. By symbolically joining all nations to pray for peace in the world. The Fluvial Parade takes place 3 days after Mary�s birthday and 3 days before the opening of the General Assembly of the U.N. on 14 September. 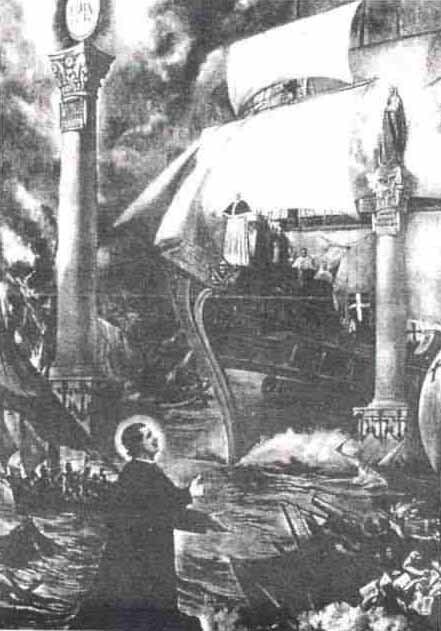 St. John Bosco had a vision on the future of the Catholic Church. A mighty flagship and its flotilla were under attack by enemy ships. In the middle of the sea there arose two solid columns. One was capped by the statue of the Virgin Mary at whose feet were inscribed the words Help of Christians. The other pillar, far loftier and sturdier, supported a great Communion Host. Beneath it was the inscription Salvation of Believers. The enemy ships closed in on the great flagship, whose captain was the Holy Father. The battle raged in full fury. The Pope was wounded and fell. He arose, was struck again and died. 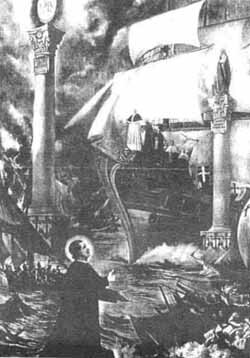 The new Pope steered his ship through the two columns and anchored the vessel to them. At this, the enemy ships panicked and dispersed. 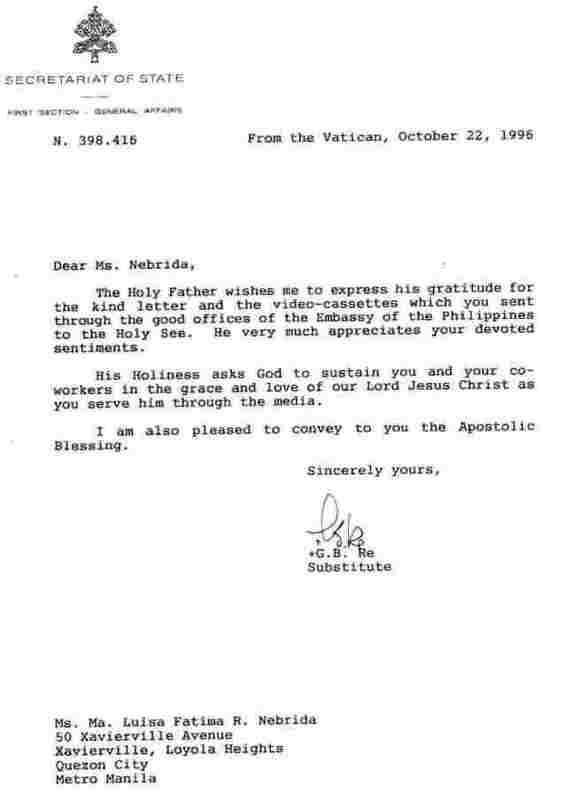 Saint John Bosco asked Fr. Michael Rua what he thought of this dream. Fr. Rua said: "The flagship symbolized the Church, commanded by the Pope, the ships represented mankind. The sea was an image of the world. The flagship�s defenders are the laity loyal to the Church, the attackers are her enemies who strive with every weapon to destroy her. 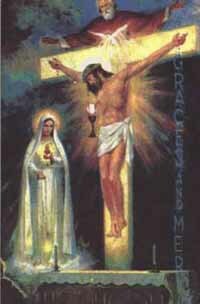 The two columns were to symbolize Mary and the Blessed Sacrament." 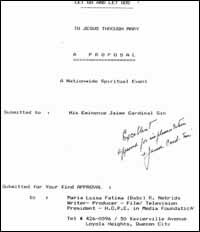 In 1929, the Fatima visionary Sister Lucia saw the following scene in Tuy, Spain. Christ crucified was being offered to the Eternal Father in the presence of the Holy Spirit.� In front of Him was the Blessed Sacrament. The chalice collected the Blood spurting from the Heart of Jesus. Beside Jesus was Mary, holding a rosary. This seems to symbolize anew the union and central place of the Eucharist and Mary in the life of the Christian. 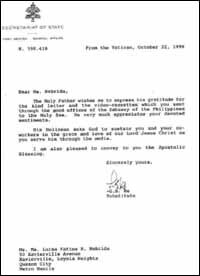 Irish Visionary, Christina Gallagher, said of the Philippines July 23, 1992 Jesus: "You, my people, are truly Mine. Through your suffering, My Mercy will save you and many who are blind. I am beholden unto you." 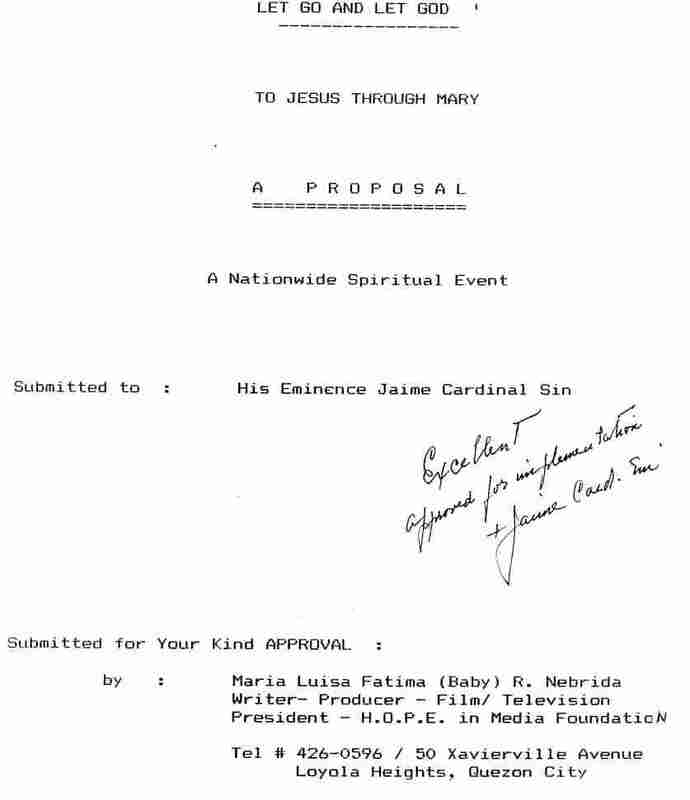 July 27 1992 Jesus: "My child, My Mother�s Heart will be made manifest in this land and it will be opened. Receive My children, for the manifestation of the Triumph of My Mother�s Heart will begin in this land and spread throughout the world." Italian Visionary, Fr. Stefano Gobbi, said of the Philippines, October 2, 1980 Mary: "Look at this immense archipelago and see how My work has also spread here in an extraordinary way". Look at the hearts and souls of these children of Mine. They are so faithful to Jesus, so devoted to Me, and so united to the Church. Through them, the light of My Heart is spreading through all the countries of this continent. I have a great plan on this people." 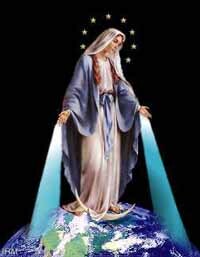 October 13, 1980 Mary: "From this blessed nation, upon which I have a great plan of love and of light, I gather you all into the refuge of my Immaculate Heart."